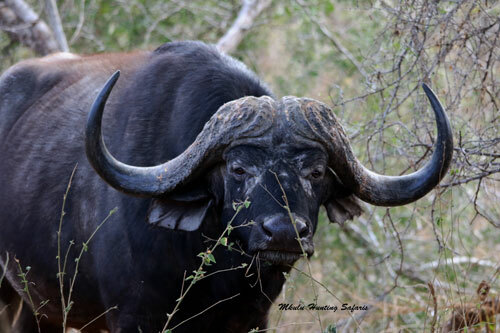 Bow hunting Cape buffalo South Africa with Mkulu African Hunting Safaris. Bow hunting Cape buffalo South Africa is one of the most challenging and exhilarating forms of bow hunting. Hunting has been with man since time began. With the evolution of hunting, hunting techniques and hunting tools man was able to hunt more game consistently. This enabled humans to sustain themselves and family. With the advent of the bow larger game species could be hunted more effectively. Soon bows and arrows became lethal weapons at longer distances. Today bows are extremely well-designed hunting tools with absolute killing power. Technological developments now make it possible for hunters to bow hunt Cape buffalo and elephants effectively. This is where bow hunting Cape buffalo South Africa takes bow hunting to the next level. The correct combination between draw weight, arrow construction, broad head, kinetic energy and shot placement will result in any hunter hunting his intended trophy. Bow hunting Cape buffalo South Africa on foot is the most exhilarating form of hunting available. Not only do you have to very close to one of the most dangerous animals on earth, you still need to keep calm and place the arrow in the correct spot. Bow hunting Cape buffalo South Africa can be done from a blind (hide), or it can be done on the walk-and-stalk method. Both forms of hunting pose pros and cons. It can be terribly difficult to get a good shot from a blind when there are numerous animals milling around. When involved in a walk-and-stalk-hunt the wind is mostly your biggest enemy. Whatever your decision with regards to hunting method, you must be aware of the inherent danger involved when bow hunting Cape buffalo. If approaching Cape buffalo on foot it truly feels like they are hunting you. Bow hunting Cape buffalo South Africa with the professionals. 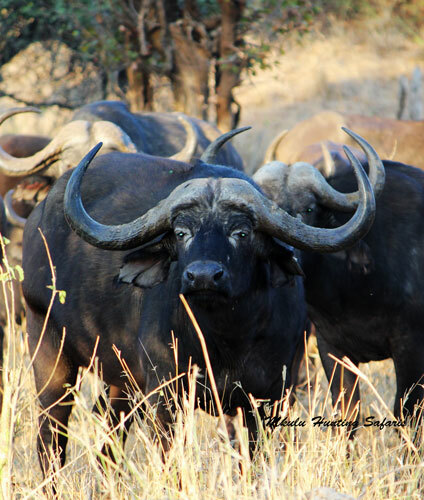 You will be guided by an experienced Professional Hunter for your Cape buffalo bow hunt. We cannot determine prior to the hunt if there will be a dangerous situation where the PH needs to step in and save lives. In the event of a Cape buffalo charge where the bow hunter cannot release an arrow before the personal safety zone of the hunting group is breached, and the PH needs to take preventative action and shoot the Cape buffalo, the Cape buffalo will be considered your trophy as per industry standards. Hunting in Africa Safaris has never had such a situation but please be aware of the possibility. The previous sentence was true until November 2016 when we were charged full-on by a wounded Cape buffalo. After the hunter wounded the buffalo, the PH had to take matters into his own hands and shot the buffalo three times. Please click the button below to read the full account of the hunt. It is not our intent to promote walk-and-stalk Cape buffalo bow hunts above any other legal method of bow hunting Cape buffalo. We acknowledge there are numerous avid bow hunters out there who, due to a variety of reasons, cannot do the physical demanding walking required to bow hunt Cape buffalo. Therefore, without reservation, we also support bow hunters who would prefer to bow hunt Cape buffalo from a blind. To walk-and-stalk Cape buffalo on a bow hunt requires physical endurance more than you would normally expect. It does happen we walk for a full nine hours per day without a regular text book lunch. However, if this is what you want to do we will gladly guide you. It is not our intent to promote walk-and-stalk Cape buffalo bow hunts only. We acknowledge there are numerous avid bow hunters out there who, due to a variety of reasons, cannot do the physical demanding walking required to bow hunt Cape buffalo. Therefore, without reservation, we also support bow hunters who would prefer to bow hunt Cape buffalo from a blind. The cost to bow hunt Cape buffalo in South Africa appreciates in some cases according to the spread of the horns. The larger the spread of the horns the higher the trophy fee becomes. The magical spread of 40” and above is the decider between the usual listed price and an increased price. All hunters are informed of the cost of hunting a Cape buffalo with a spread larger than 40”before the hunt commences. It is the duty of the Professional Hunter to inform the hunter whether the spread of a Cape buffalo is larger or smaller than 40”. Cape buffalo bow hunting prices 2018 for the African bow hunting season is $ 12 000-00 for Cape buffalo with a spread of less than 40″, inclusive of trophy fee and daily rates for 5 hunting days. A 5% discount will be granted for the first 3 bow hunters who book a Cape buffalo bow hunt with Mkulu African Hunting Safaris for 2018. Cape buffalo bow hunting prices 2018 (for Cape buffalo with a spread in excess of 40″) season is $ 14 500-00 for Cape buffalo with a spread of between 40″ and 42″, inclusive of trophy fee and daily rates for 5 hunting days. A 7,5% discount will be granted for the first 2 bow hunters who book a Cape buffalo bow hunt with Mkulu African Hunting Safaris for 2018. Large Cape buffalo occasionally become available in the 44″+ range. Please contact us if you are interested in a hunt like this. Arrows are as integral to bow hunting Cape buffalo as the bow and broad head are. Using good arrows that are manufactured by well-known reputable companies always wins the day. A minimum arrow weight of 880 – 900 grains (gr) is suggested with an overall minimum arrow weight of 700 grains (gr). The shaft of the arrow should be thinner than the ferrule of the broad head. Easton FMJ DG arrow have yielded superb results in our experience. The average expected shooting distance when bow hunting Cape buffalo is 35 – 40 yards on a walk-and-stalk-hunt and 20 – 25 yards when still hunting from a blind. Do not use mechanical broad heads on these extremely tough animals. The broad head should be a fixed 2-blade cut-on-impact type with a minimum of 1,2″ cutting edge. The best bow for bow hunting Cape buffalo is the same as trying to decide which vehicle is best for hunting purposes (Toyota of course!). We can spend hours arguing back-and-forth which bow will be best: Mathews, Bowtech, Diamond or whichever bow you own. Fact of the matter is each bow has unique qualities that can contribute to a successful Cape buffalo bow hunt. In the end it will be the operator that determines the outcome. If there is no operator error the hunt will be successful provided the equipment is functional and in good working order. 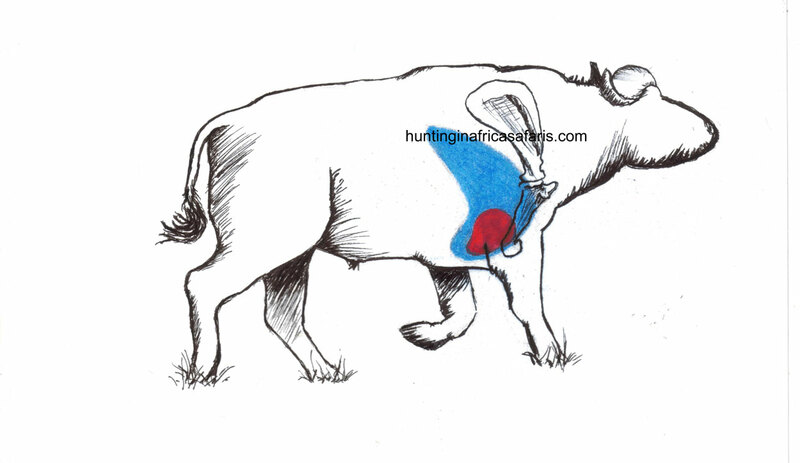 Cape buffalo have a rather large vital area when thinking about bow hunting shot placement. On a broad side shot it is recommended to place the arrow right behind the shoulder, about one third of the way up from the bottom of the chest to the top of the back. This shot will result in a high heart / lung shot leading to the Cape buffalo expiring in the least amount of time. Quartering to shots are not recommended due to the very heavy brisket area and the sheer depth of the chest. On a quartering away shot care should be taken not to attempt to have the arrow penetrate through too much stomach content. However, a quartering away bow shot on Cape buffalo can be placed by bisecting the angle formed by the front feet into a position slightly less than one third of the way up from the bottom of the brisket to the top of the back. The following tips for bow hunting African Cape buffalo are done from the perspective of walk-and-stalk hunting. 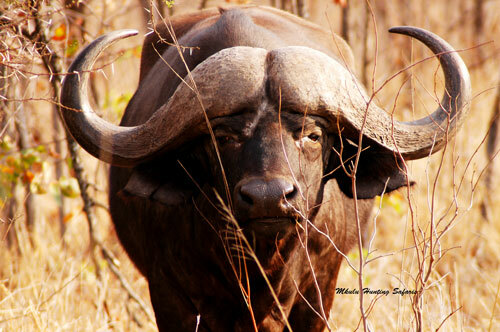 Cape buffalo are usually active during the early mornings and late afternoons. It is during the heat of the day that these bovines rest up in a comfortable shady spot. This is mostly the best time of day to find them. Our experienced trackers stick to the tracks until we find your trophy Cape buffalo that hopefully will not be fully aware of our presence. Bear in mind there can be brush and twigs that may deflect your arrow so be at the ready to take a shot at a moment’s notice when the Cape buffalo presents a shot. Once the shot was taken, allow the buffalo enough time to realize it is dead. If this takes 90 minutes then so be it. Be sure. Be safe. 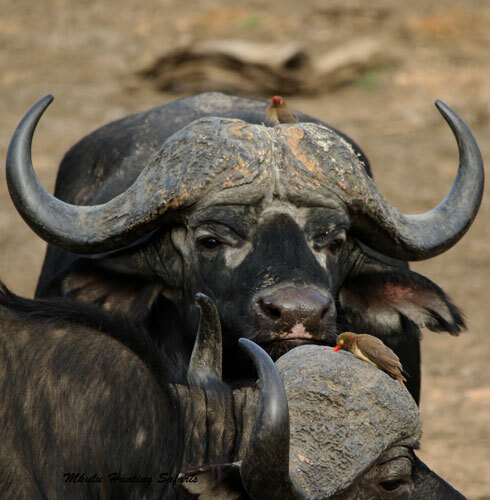 Cape buffalo hunts can be conducted year round. December, January and February are usually very hot which may lead to some discomfort if you are sensitive to heat. The lodges we stay at all have air conditioning and swimming pools allowing one and all to cool off when things heat up. Our recommendation for the best time of year for bow hunting African Cape buffalo would be from April to October / November.